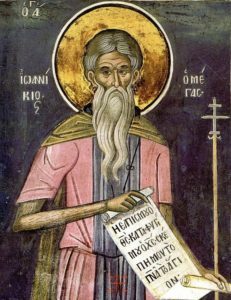 With the streams of thy tears, thou didst cultivate the barrenness of the desert; and by thy sighings from the depths,thou didst bear fruit a hundredfold in labours; and thou becamest a luminary, shining with miracles upon the world, O Ioannikis our righteous Father. Intercede with Christ God that our souls be saved. Epistle Reading ~ The reading is from St. Paul’s Letter to the Ephesians 2:4-10. Lucille Telegades (40 days) Survived by her son Tom (Donna) Telegades, her daughter Theodosia Lane, granddaughter Nicole Panagos and grandson Peter (Shannon) Panagos. Chloe Lambert Brokow (1 year) cousin of Stephanie Pavlakis, mother of Bradford and Barry (deceased) Brokow. Last Sunday, October 28th, I tried to clarify who could and who could not receive Holy Communion. I don’t usually do this, but with so many new faces, and some who were clearly not Orthodox Christians, I felt compelled to make the announcement. Unfortunately, it created some confusion. So, let me try to explain more clearly. WHO MAY RECEIVE HOLY COMMUNION Baptized and/or Chrismated Orthodox Christians who are in good standing with the Church. Good standing means that if you are married, you must have been married in the Orthodox Church. If you were married in the Orthodox Church and divorced civilly, you must also have an Ecclesiastical Divorce. (Ask Father Andrew for details.) This Ecclesiastical Divorce requires petitioning the Metropolitan. You may receive Holy Communion even if you are married in the church but only divorced civilly as long as you are not living with someone and have an intimate relationship. WHO MAY NOT RECEIVE HOLY COMMUNION IF YOU HAVE CONTRACTED ANOTHER MARRIAGE CIVILLY. YOU MAY NOT RECEIVE HOLY COMMUNION IF YOU ARE LIVING WITH SOMEONE AS MARRIED, BUT ARE NOT. Also, if you are under a penance from a priest or spiritual father not to receive, you many not receive Holy Communion. The restrictions also include participating as a sponsor at a baptism. You may not if you are not in good standing with the Church. If you have a questions about this matter that I may not have covered or if what I have said still isn’t clear to you, please feel free to ask me about further clarification. Fellowship Hour In loving memory of Lucille Telegades, her family is sponsoring the coffee hour. Thank you Last Sunday, October 28, Judy Jimokas was our guest organist and choir director. We thank her! DOP Food Drive · Please pick up a paper bag, fill it with non-perishable food items and return it to the church by Nov 11. The donations will be taken to Christ Community Church in Pompano. Cancer Chapter It’s time for our Garage Sale fundraiser on Friday, November 9th and Saturday, November 10th, 2018. The event will be held in the main hall between 9AM-3PM on both days. All proceeds support cancer research at the Sylvester Comprehensive Cancer Center at the University of Miami Miller School of Medicine. We are accepting donations of gently used household items, interesting collectibles, costume jewelry, vintage items and artifacts. Used clothing will not be sold. If you are interested in donating articles to the sale please see any member of the Cancer Chapter after church during the coffee hour. Items will be accepted in the small hall on Thursday, November 8th from 10am to 3pm. Stewardship · Watch your mail for the Stewardship materials for year 2019. We ask that each parishioner fills out a form yearly. Bring your completed form to church on Sunday, November 11 and join us for the Steward Appreciation Luncheon. Also, please check to see that you are current in your year 2018 monetary pledge. Thank you! Elections Nov 4: Support your dance program! The Dance Advisory Committee (DAC) Elections are SUNDAY Nov 4 in the hall following the Divine Liturgy. To vote you must be stewards in good standing and your child/children or grandchildren are active in dance. Only ONE member of each family may vote on behalf of the family. Philoptochos Thanksgiving Bake Sale· Sunday, November 18th. Support the many ministries of Philoptochos by baking or buying or both. Please deliver baked goods to the hall on Sunday, November 18th before 11am .